See them? They're evil...and everywhere. Yup, you read that right. Moss turds. Not mouse turds or moose turds (cuz that's just plain gross). I'm talking about the little bitty pieces of moss that grow in the cracks of sidewalks. They somehow come loose, either by a passerby or from kids picking at them with sticks. Well, guess what? These little moss turds are slippery suckers. I slipped on a couple on my run last night, and I had to take a picture of the culprits. You can't really see them that clearly, but they're there. I swear to you. Evil little sidewalk dwellers. At least the rest of the nighttime run was uneventful and quick. Anywho, today's run was much less moss-covered. In fact, it was a gorgeous day out! Goober and I went for a 4 mile jaunt around the neighborhood, enjoying the warmer air, sunny skies and smells of freshly cut grass. Ahhhh. It was a delightful run. We stopped at the local Target for some necessities and little Goob was totally in a good mood. Yay! You see, Miss Goober has been teething and not a happy baby. Her sleeping is erratic and she's been "moaning" while in her crib (but surprisingly half asleep while doing this). It's funny because Murphy has been checking on her during these little moan/talk sessions of hers...I hear Goob's bedroom door open a bit (we don't latch it), then I hear Murphy meowing at his baby sister. It's pretty endearing, actually. I'm glad that he's concerned with her well-being, as it doesn't seem like he's saying "geez, kid, shut up." When she cries during the day he doesn't flinch or do anything at all around her, so I know that this nighttime checkup is the real deal of a big bro kitty. I sure hope that tooth comes through soon. Please? Be sure to follow Runner Swag for the latest Running Giveaway listings! Good luck with the tooth! My baby girl got her first tooth on Monday and *finally* had a good night's sleep after. Hang in there. I remember T Junior went through that a little. We thought it was teeth and it was gas or something. We got him something called gripe water (?) I think and it seemed to help. That is so cute about big bro kitty. Aw. 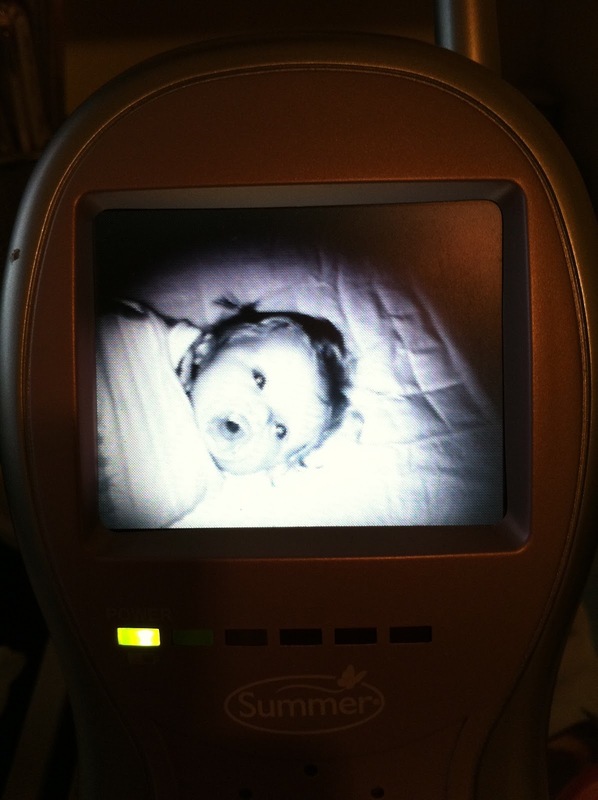 your baby monitor has a screen! Holy AWESOME! Ha ha ha! Moss turds. You need to move to Southern California - we're too dry to grow moss turds. i have never seen moss turds. it looks like mold! So cute (the photo and the big brother kitty, not the moss turds). Hope that tooth comes in soon! My youngest is 14, but our cat can still sense when she's upset and rushes in to save the day.